The FineSpine™ Knee Adjustment - A SpineHolder's Manual presents The FineSpine™ Method (TFSM): several simple self-adjustments per the 3 waves of the human spinal column which work to reverse the effects of gravity, use, time and abuse on the human frame. Interestingly enough, in our efforts seeking to maintain the physical platform it came that tho the Lumbar Adjustment serves some to also benefit the body below the waist - due "centering" of hips & knees & ankles - that at least per the knees - more could yet be done. Not just quite recalling how it came - regardless - here find a further useful method of self-adjustment per, dare we say, the next weakest link in human anatomy - the knee. Thus...here just saying some more "…Bio-Engineering That Works…". 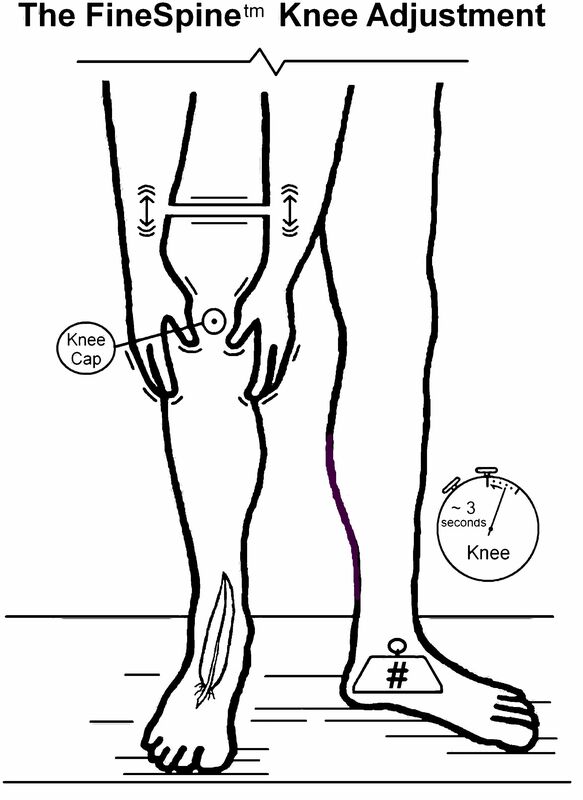 So...please here find our late discovery/addition to TFSM - The FineSpine™ Knee Adjustment. Not to put too fine a point on it...but..."everyone" has knee problems (maybe some just don't know it yet). FSLtd, to which no Doctors are associated, here yet seeks to provide some here thought valuable information to possibly address just some of these problems. We will not go into a detailed discussion of anatomy of the knee, as such is readily available on the WWW, and anyone who is experiencing issues in this area would maybe do well to look into it, as the human knee is quite a complex of engineering, and is subject to several types of issues/injuries/degradation. The FineSpine™ Knee Adjustment offers one a way to possibly "correct" just some of these issues. It basically involves a firm, vertical "jiggling movement", i.e. up and down, in line with the leg, that may work by "repositioning" the joint into its once more "normal" arrangement. This is certainly not thought to correct major injuries and/or degradation, which the knee is certainly subject to, and one needs to be aware of what their issue is at some level. But it does work to address "a sore knee", and may further, and significantly, serve as a way to "maintain" proper knee configuration, as a means to avoid such "soreness" and/or degradation. It takes 2 hands to do it, firmly grasping either side of the joint, with the knee cap centered between the hands. It seems to work by encouraging/allowing the knee cap/joint to "find its place". The adjustment can be done standing, with ones weight on the opposite leg and is also quite convenient to be done while sitting in a chair, as of course there is little if any weight on the leg as such. The movement is not far...maybe an inch each way up and down...and takes but a few seconds...but it does yet take a bit of effort. The lower leg has to be allowed to move during the jiggle, thus the need for little if any weight on that leg. As with all aspects of The FineSpine™ Method, this is self-adjustment. The user has full and ultimate responsibility in its employ. If pain or stiffness develops, discontinue use. This is provided as an educational and informational resource for the beholder. FSLtd assumes whatsoever no liability in its use, effects and/or consequences.